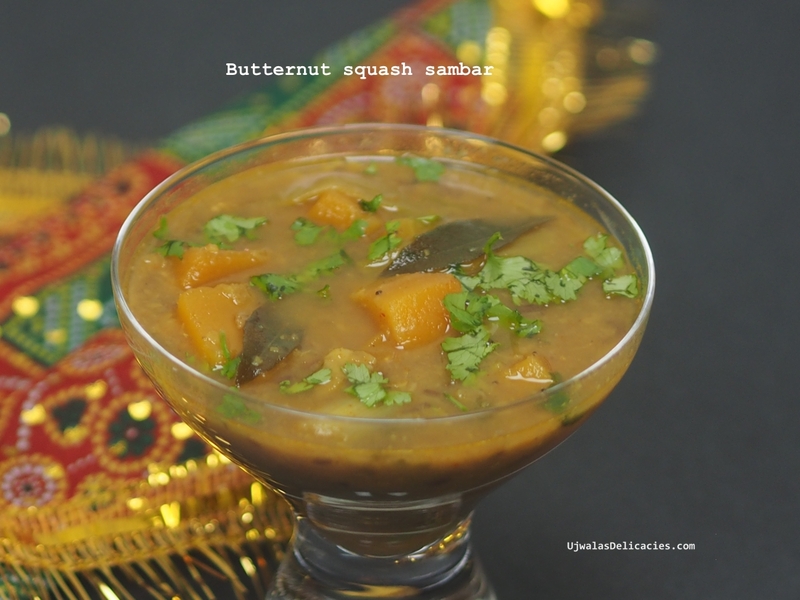 Butternut squash is one of the most popular winter-squash vegetables. 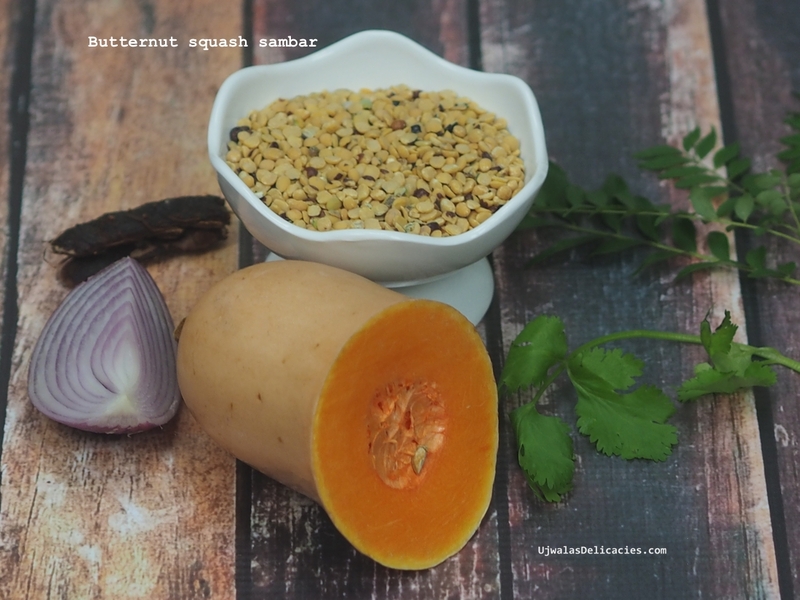 Squash combined with lentils makes it a nutrient rich dish packed with protein, fiber, vitamins etc. Sambar is south Indian lentil soup. A every day dish usually eaten with rice, idly or vada. It can be consumed as soup as well. Being a winter-squash member, butternuts can be readily available in the USA markets from September until the middle of December. However, since many fruits arrive into USA from South American continent, they can be easily found all around the season. Being a member of pumpkin family, butternut squash has a pleasant nutty flavor and mildly sweet taste. Fresh raw butternut cubes may add special tang to vegetable salads. It is found favorite in both savory as well as a sweet dishes. It can be used in variety of delicious recipes as baked, stuffed, or stew-fried; however, eaten best by steam cooking to get most nutrients. In Mexico, butternut squash bisque (soup) with added fruits, herbs or seafood is a favorite appetizer. Roasted and tossed butternut squash seeds can be used as snacks. Butternut squash has no saturated fats or cholesterol; however, is rich source of dietary fiber and phyto-nutrients. Squash is one of the common vegetables that often recommended by dietitians in the cholesterol controlling and weight-reduction programs. It has more vitamin A than that of in pumpkin. At 10630 IU per 100 g, it is perhaps the single vegetable source in the Cucurbitaceae family with the highest levels of vitamin-A, constituting about 354% of RDA. Vitamin A is a powerful natural anti-oxidant and is required by the body for maintaining the integrity of skin and mucusa. It is also an essential vitamin for optimum eye-sight. Research studies suggest that natural foods rich in vitamin A help the body protected against lung and oral cavity cancers. Furthermore, butternut squash has plenty of natural poly-phenolic flavonoid compounds like a and ß-carotenes, cryptoxanthin-ß, and lutein. These compounds convert into vitamin A inside the body and deliver same protective functions of vitamin A on the body. 2 tbsp - your favorite oil. I used coconut oil. You can use ghee as well. ½ - red onion or 3 sprigs spring onion. Cook toor dal lentils in pressure cooker till 2 whistles. Or cook in a pot with 1 lentils vs 2 water till soft with lid closed. In a pot, pour oil, heat to medium high. Add mustard seeds. When they splutter, add cumin. Fry till dark brown. Add curry leaves, chillies, diced onion or spring onion, diced butternut squash squares. Cook for 2 minutes. Stir every 1 minutes. Add turmeric powder, ginger garlic paste. Add 3 cups of water. Squeeze tamarind and add extract. Let it boil on medium for 10 minutes. Now add cooked lentils. Add salt, chill powder, fresh ground coriander seeds. Boil on medium for another 30 minutes. Longer you boil, better it tastes. Consistency should be like soup. If it is thick, you can add water. Don't add much water in the beginning. Otherwise it takes time to boil and bring to right consistency.